Please do your research on carbon dioxide emissions, green-house-gases (GHG), and environmental policies that clean and regulate emissions from the electric power sector. The following information is based on WBMLP’s research and collection of data related to the electric power sector in Massachusetts and the Nation. WBMLP is extremely proud of its contribution towards reducing GHG emissions through existing non-GHG emitting generation, long-term renewable power supply projects and funding of energy efficiency and conservation programs in our service territory. WBMLP’s ability to govern its operations at the local level resulted in significant amounts of existing non-GHG emitting energy generation, highly competitive electricity rates and investment in cost effective renewable and clean energy projects. By the end of 2016, WBMLP purchased 64% of its annual power supply though non-GHG emitting solar, wind, nuclear and hydroelectric generation and purchase power agreements. WBMLP’s non-GHG emitting energy supply, as a percentage of sales, was 54% in 2016 based on our MassDEP annual reporting. In comparison, Investor Owned Utilities (IOU’s) reported only 6.2% - 7.3% of sales as non-emitting MWh’s in 2013, according to MassDEP’s most recently published data. 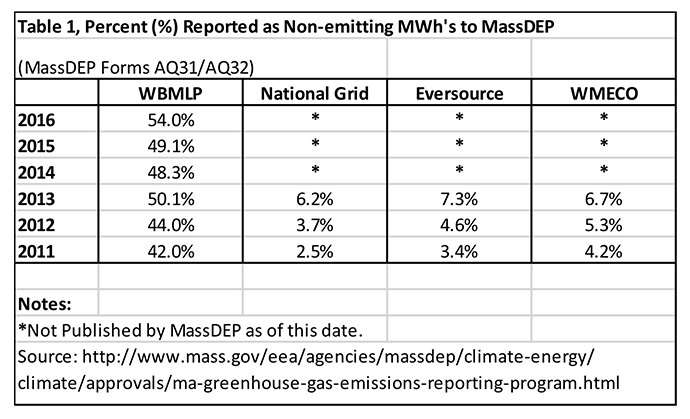 The MassDEP summary of “Percent Reported as Non-emitting” in Table 1 above, emphasizes the fact that WBMLP’s ratepayers already pay for significant and specific volumes of non-GHG emitting clean energy. WBMLP’s ratepayers pay for this existing clean energy supply and our local regulatory process will continue to develop and/or purchase both renewable and clean energy given our unique structure and legislative authority. WBMLP is included in the Commonwealth’s “energy generation and distribution sector” and it’s the only sector that has significantly reduced GHGs to date. GHG emissions from the “energy generation and distribution sector” were approximately 27.8 MMTCO2e in 1990, our baseline measurement year. The Commonwealth projected our sector would reduce GHG emissions by approximately 7.4 MMTCO2e and contribute towards approximately 26% of its overall 2020 goals. 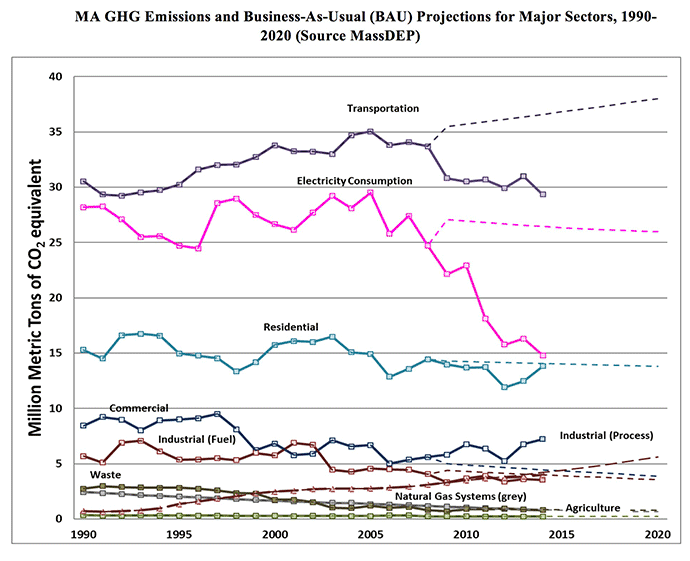 By the end of 2014, the most up to date information available on MassDEP’s webpage, the “energy generation and distribution sector” reduced GHG emissions by 13.4 MMTCO2e, a 48% reduction from the 1990 baseline level. Our sectors reduction in GHG emissions through 2014 exceed expectations and contributes towards 68% of the total progress to date in meeting the 2020 goal for all sectors. This reduction doesn’t include the forecasted 2017 closure of coal generation at Brayton Point, which will eliminate all coal generation and its significantly higher GHG emissions from the Commonwealth’s energy portfolio. 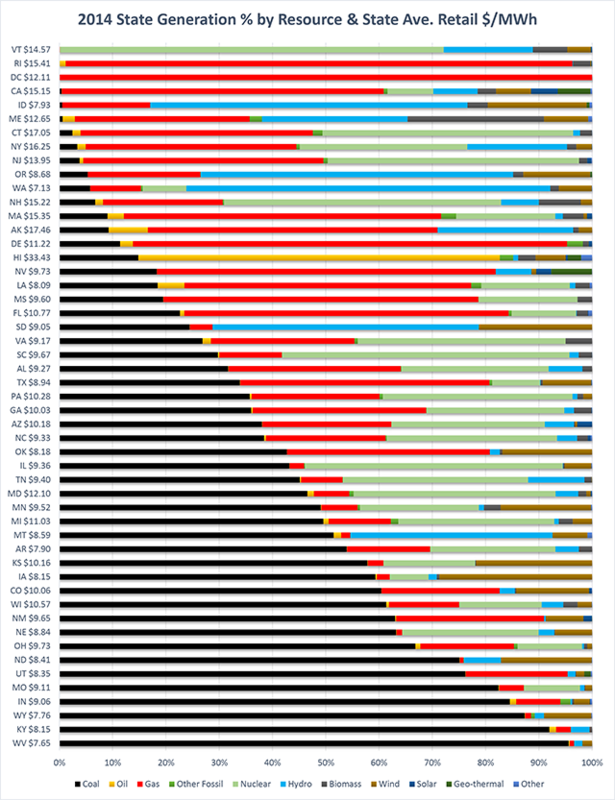 The 2014 energy generation portfolio for each state is ranked from lowest to highest percent of coal based electricity generation in the chart below. Each state's average 2014 electricity rate ($/MWh) is included to compare the consumer cost of each state’s sources of energy generation. This chart points out that states with the highest percent of coal-based generation and corresponding highest GHG emission rates, have the lowest electricity rates in the nation, while states with the least amount of coal generation (excluding the large-scale hydroelectricity dependent states of Idaho, Oregon, and Washington) and lower GHG emission rates, have the highest electricity rates in the nation. 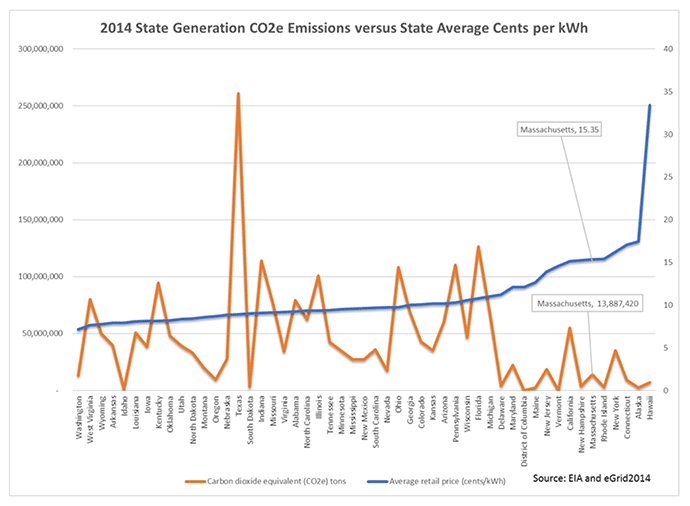 MA ratepayers pay some of the highest electricity rates in the nation and when you compare the 2014 average state electricity rates to state CO2e emissions, it is clear that Massachusetts and New England as a whole, are leading the nation in reducing GHG emissions. CO2e is defined as carbon dioxide equivalent and is a standard unit for measuring the impact of all greenhouse gases in terms of the amount of CO2. This chart points out that states with the lowest GHG or CO2e emission levels have the highest electricity rates in the nation. The consumers and ratepayers of Massachusetts already lead the nation in making good environmental decisions to reduce GHG emissions and we willingly pay higher prices to do so. The U.S. Environmental Protection Agency (EPA), through the Clean Air Act, proposed a Clean Power Plan (CPP) to reduce carbon dioxide (CO2) emissions from existing power plants. The CPP would require each state to reduce its CO2 emissions rate from existing fossil fuel plants to meet state-specific standards (lbs/MWh) starting in 2020. The EPA estimated the rule would reduce national CO2 emissions 32% from the U.S. electric power sector in 2030 relative to a 2005 baseline level. At the end of 2016, the nation’s electric power sector reduced C02 emissions by 25% relative to 2005 levels. Table 12.6 below is published by the Energy Information Administration and available online at: https://www.eia.gov/totalenergy/data/monthly/pdf/sec12_9.pdf. 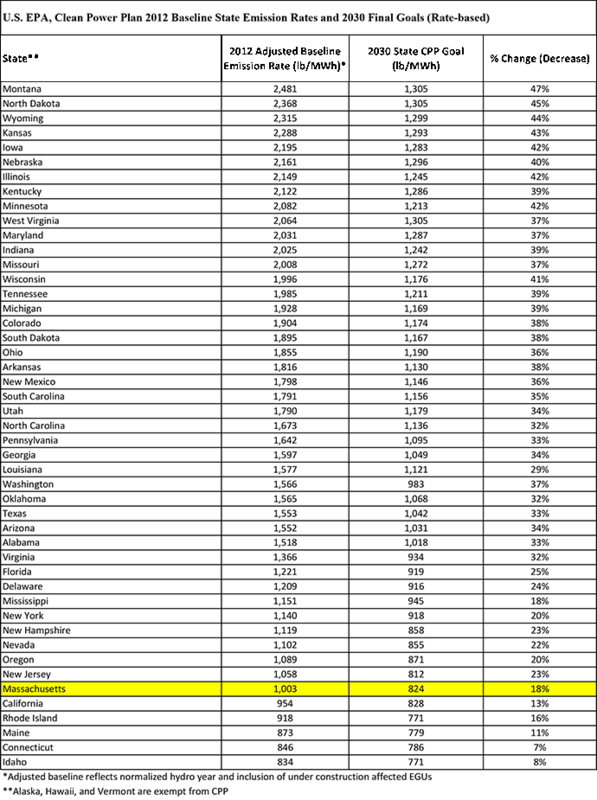 EPA recognizes Massachusetts as having the nation’s sixth lowest emissions rate in 2012 as highlighted is the next chart comparing the 2012 state emission rates and the 2030 emission rate goals for each state resulting from the implementation of the CPP. State’s are listed and ranked from highest to lowest 2012 emission rate in lbs/MWh. The EPA estimates Massachusetts will exceed all the proposed CPP emission reduction goals by 2020 even without the establishment of a CPP. Under the â€œrate-basedâ€� CPP goal, the 2012 actual CO2 emission rate for Massachusetts was 1,003 lbs/MWh. The CPP 2030 emission rate goal is 824 lbs/MWh for Massachusetts. The EPA estimates Massachusetts 2020 emission rate will be 808 lbs/MWh, well below EPAâ€™s 2030 final goal even without implementing a CPP. ISO-NE calculates and publishes annually, the New England region and state specific emission rates in an â€œAir Emissions Reportâ€�. The most recent â€œAir Emissions Reportâ€� summarizes the 2015 average emission rates for the New England region and Massachusetts. West Boylston calculates its own emission rate based on its specific annual power supply. New Englandâ€™s emission rates as a region is extremely low compared to the rest of the nation. The Town of West Boylstonâ€™s emission rate is less than half the Massachusetts average emission rate in 2015. On a per-capita basis, the energy-related carbon dioxide emissions by state in 2014 is graphed below. Massachusetts has the fifth lowest per capita emissions nationwide.